This entry was posted in Artificial Intelligence, Deep Learning on September 21, 2018 by navacron. Gave a talk at Google Next 2018 about machine learning. Talk includes usage of the following for applied machine learning in context of media and news publishing. This entry was posted in Artificial Intelligence, Deep Learning on July 26, 2018 by navacron. Gave a talk about BQML along with Abhishek product manager of AI at Google. Democratization of AI via BigQuery. This entry was posted in Artificial Intelligence, Deep Learning on July 25, 2018 by navacron. This entry was posted in Artificial Intelligence, Company News, Deep Learning on March 24, 2018 by navacron. 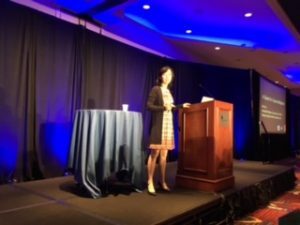 Giving a talk about Google Cloud/ Machine Learning applied to News at GDA leadership summit. 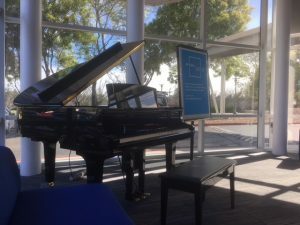 While waiting a Googleplex was amused by AI Piano, playing AI generated music. This is based on project Magenta, Googles initiative for music and art using AI. This entry was posted in Artificial Intelligence, Deep Learning, Technology on February 19, 2018 by navacron. This entry was posted in Artificial Intelligence, Deep Learning on December 3, 2017 by navacron. This entry was posted in Artificial Intelligence, Deep Learning on September 22, 2017 by navacron. Have been reading research work for recommendation engine, specifically that can be used to do better news/blog recommendations. Links on work in this area including open source code. Session Based Recommendation System https://arxiv.org/pdf/1511.06939.pdf . Only uses sequence of content, and not the content itself. This entry was posted in Artificial Intelligence, Deep Learning on September 10, 2017 by navacron. 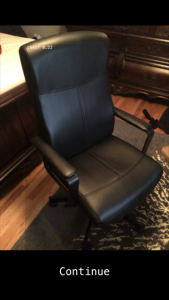 Just ran first ran deep learning model with the camera app example. Pretty good image recognition!! The next level is object detection, i.e creating a bounding box around detected image. 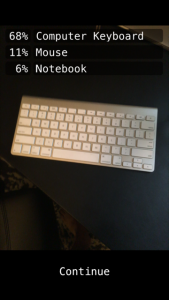 This entry was posted in Deep Learning, iPhone on June 11, 2017 by navacron. Deep learning is progressing rapidly. There is a new interesting research paper every other week. This is a list of essential deep learning research by categories. These are the recent advances for CNN, original was Lecun-5 in the 98 paper mentioned above . Finding a bounding box around different objects is harder than simply classifying an image. This a class of image localization and detection problems. One of the hottest areas of research. This is a class of algorithms where 2 neural networks collaborate to generate e.g. realistic images. One network produces fake images (faker), and the other network learns to decipher fake from real (detective). Both networks compete with each other and try to be good at their jobs, till the faker is so good that it can generate realistic images. Fake it till you make it! Getting labeled data is expensive, while unlabeled data is abundant. Techniques to use little bit of training data and lots of unlabeled data. Research on being able to ask question on images. e.g. asking if there are there more blue balls than yellow about an image. Being able to take a picture and a style image e.g. a painting, and redraw the picture in the painting style. See my blog on painting like Picaso. This is area of unsupervised learning. An auto encoder is a neural network that tries to recreate the original image. e.g. give it any picture and it will try to recreate the same image. Why would anyone want to do that. The neural network tries to learn a condensed representation of images given that there are commonalities. Auto encoders can be used to pre train a neural network with unlabeled data. This entry was posted in Artificial Intelligence, Deep Learning and tagged deep learning, papers on June 4, 2017 by navacron. Released CatGan code. This was done as last assignment for NYU Deep Learning course, taught by Yann Lecun. 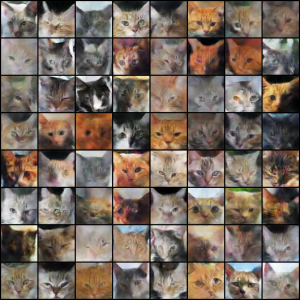 This is a conditional GAN, and can train it to generate 4 different types of cats i.e. white, golden, black and mix. The following is output conditioned on golden cats. By favorite one is 3rd one from the right in the first row. Everytime the GAN is run it will generate unique cats like these. For more cats visit the github page. This entry was posted in Deep Learning, Python and tagged deep learning, gan, pytorch on June 2, 2017 by navacron. This entry was posted in Deep Learning on March 12, 2017 by navacron. This entry was posted in Deep Learning, Python on March 12, 2017 by navacron. Have been researching what are available options for taking a deep learning course living in NY/NJ. I have already taken most of the free content cs231n, machine learning coursera, udacity. Looking into either NYU or Stanford for an official course for Winter 2017. This entry was posted in Artificial Intelligence, Deep Learning on December 4, 2016 by navacron. 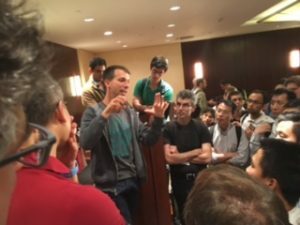 Attended the biggest ever machine learning conference in number of participants and papers. Red hot interest in deep learning and reinforcement learning. Great advancements in vision (Microsoft deep residual networks 1000 level deep neural networks), sound to text (Bidu Deepspeech 2.0), reinforcement learning (Deepmind A3C algorithm, a AI player learns to explore and play in 3D Lybrinth maze, folks who developed AlphaGo). Image captioning /understanding getting even more sophisticated (dense captioning work by Fei Fei and team). Language understanding is still lagging and needs breakthrough, however a couple of papers from Metamind about question answering system on text and especially on images seemed promising. My personal conclusion is that there is still a lot to go towards the goal of strong AI. Though AlphaGo (Deepmind system that beat Go) and DeepQ are great strides in AI, these systems only learn by intuition encoded in neural network weights backed by huge compute resources, and this learning seems to be different from the way humans learn. A true AI systems should be able to use the same architecture and apply to car driving, learning to play chess, a new language or cook. I feel if breakthroughs are not made in a few more years, there could be another AI winter coming. Also at the same time it feels we are almost there to the quest of true AI! Metamind acquired by Salesforce. Should be watching the salesforce conference announcements how they indent to use deep learning technologies. Clafiai – NY based startup for image captioning. Interesting use case for CMS and for accesibility. Netflix – Patterns for machine learning. Netflix uses Time machine an interesting architecture to train models using production data. Maluuba – Upcoming Canadian startup that specializes in natural langauge processing. Claimed that thier results are better than Google/Facebook. Dr Fei-Fei Li (Stanford) after her keynote. Her work on image captioning is covered on NYTimes. Interesting talk about deep captioning her latest work on understanding the story. Yauan Lecunn (NYU) after his workshop discussion asked about meta thinking, learning to think. Also asked if he will be teaching the deep learning course at NYU next spring, which he affirmed. David Silver (Google Deepmind). Excellent tutorial on deep reinforcement learning, that learnt to play arcade game just from raw pixel data, and alphago. 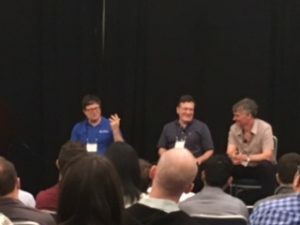 Asked him question what are the limitations, and he told me that challenges are for robotics where decisions have to made quicker, and for rewards that are far in the future e.g. needle in the hawstack rewards. Richard Socher (Metamind CEO/ Bought by Salesforce). 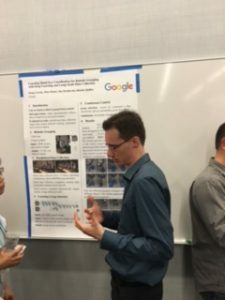 Chat at the poster session about his paper on question answering system on text and images. Am curious to know how Salesforce intends to use deep learning. Wonder if SugarCrm is diving into machine learning. Matthew Zeiler (ClarifAI CEO). Meeting at the Intrepid after party. Clarifi provides api for image analysis. Discussion on interesting use cases for news industry. Adam Trischler (Maluuba Researcher). Talk about question answering system. They are soon to release products Canadian startup, and claim to have better results than Facebook and Google on public datasets. Howard Mansell (Facebook AI). Chat about Torch usage in Facebook. The talk was about how Torch is a deep learning tool for research. James Zhang (Bloomberg Machine Learning Researcher). Discussion about how to use news in time series prediction. Yan Xu (SAS). Talk about how deep learning can be used in marketing automation. SAS is working on predictive modeling. This entry was posted in Artificial Intelligence, Deep Learning and tagged AI, deeplearning on July 4, 2016 by navacron.